There is a reason the new edition of Saunders Comprehensive Review for the NCLEX-RN? Examination has been called "the best NCLEX review book ever." Essentially, you'll find everything you need to review for the NCLEX exam under one cover - complete content review and over 4,200 NCLEX-style questions in the book and on the free companion CD! Don't make the mistake of assuming that the quality of the questions is the same in all NCLEX review books, because only Silvestri's Comprehensive Review for the NCLEX-RN? Examination includes the kind of questions that consistently test the critical thinking skills necessary to pass today's NCLEX exam. And, what's even better is that ALL answers include detailed rationales to help you learn from your answer choices, along with test taking strategies that provide tips for how to best approach each question. It's easy to see why Silvestri is THE book of choice for NCLEX review. But don't just take our word for it -- read any customer review or ask your fellow classmates to see why Silvestri users believe that there's nothing else like it! Each question includes the correct answer, a complete rationale for all responses, and a test-taking strategy to help students develop strategies for locating the correct response. Each question includes a page reference to an Elsevier nursing textbook to help with remediation. All alternate item format questions are included, with multiple response, prioritizing, fill-in-the-blank, figure/illustration, chart/exhibit, and audio questions. Organization by nursing content areas provides a logical, effective review. Pyramid Terms define key terms at the beginning of each major unit or chapter. Pyramid Points within each chapter highlight the content that is important in preparing for the NCLEX-RN examination. Pyramid to Success sections provide an overview of major units or chapters and specific content related to the latest NCLEX-RN test plan. Pharmacology is emphasized with 13 pharmacology chapters, a medication and intravenous calculation chapter, and a pediatric medication calculation chapter to reflect priority content on the NCLEX exam. Introductory chapters cover preparation for the NCLEX-RN exam, nonacademic preparation, test-taking strategies, the NCLEX-RN exam from a student's perspective, and transitional issues for the foreign-educated nurse. A comprehensive exam consists of 265 questions related to all content areas in the book and representative of the percentages identified in the NCLEX-RN test plan. CD-ROM allows practice in quiz, study, or exam modes, with questions selected from content area, integrated process, category of client needs, or alternate item format type. The review is based on the new NCLEX-RN test plan, effective April 2007. Now in full color - with over 100 illustrations to enhance important nursing content. 200 more questions have been added, for a total of 4,210. Includes the new chart/exhibit alternate item format, in addition to questions with audio components. Companion CD-ROM uses a pre-diagnostic exam to generate an individualized study plan. This is by far the best NCLEX review I've purchased (I also own the Lippencott, and Mosby books). This book has the most questions, the best rationales and the CD was extremely useful. I haven't taken the NCLEX yet, but since my university uses only NCLEX style questions on exams...this review book has been the one that helped the most. Great book! Bad price at Amazon!! I was very excited about getting this book to use as a review because it was so highly recommended and had the alternative format questions. However, just getting thru the first few chapters I have found some mistakes on the alternative format answers and rationals. I was concerned about it because it made me think if these had mistakes, how can I trust the answers and rationals of the other questions. I know nobody is perfect, but I would think these issues would have been ironed out before they released the book. Otherwise, the book is nicely laid out. this one. The others were not nearly as comprehensive and easy to use. ...this comprehensive book is amazing! It has provided me with an excellent source for review as well as information/concepts that I did not pick up along the way during nursing school. One must be committed to get through this very detailed book, but the end result is well worth it (as if you didn't already know that). The questions at the end of each chapter and in the CD-ROM, in my experience, are similar to that of those found in nursing school exams. They strive to be in an NCLEX style, but are more geared toward testing your understanding of the content found within the chapter. This is helpful for content review purposes, but they are not as solid of examples of NCLEX questions as compared to the Kaplan book (another book I recommend). However, the rationales Saunders provide make up for that issue nicely. I Just Passed My NCLEX Using This Book!! Must have for foreign educated nurses!!! If you studied and graduated from a non US nursing program you must prepare for the NCLEX thoroughly, I graduated 9 years ago in the UK and thought I had a good general knowledge base, however once I started using this book I realized how much my UK education had not prepared me for the US system and the NCLEX. At first I found the rationales in the included chapter exams very difficult to agree with in terms of prioritization, coming from the real world critical care environment, but the more questions and rationales you do the more prepared you will be. I would also recommend a question and answer book - I used the incredibly easy NCLEX RN question and answer book and the Mosby one. As much as I recommend this book I also found it very useful to answer questions from several different publishers as I found they would all be somewhat different but it is a very accessible way of learning and getting questions wrong really helps for the right answer to 'stick'. Overall a 5 star recommendation, there are no other publications I am aware of that offer this sort of package. Buy it and work hard! I found out this morning that I passed! in 75 questions! The ONLY book you need!!! I loved it and I PASSED! I have been looking for a NCLEX-RN book that would help get me prepared for BIG TEST. I been using it has we cover the sections in my lecture class. So far, I have used it as a study guide for endocrine and cardiac exams with success. I haven't found any differences for this review book and my lecture book. AMAZING!!! VERY HELPFUL NCLEX-RN REVIEW BOOK!!!! This book is the BEST!!! In my opinion, this NCLEX review book is a "MUST" for preparing for the NCLEX-RN exam. This book is very organized and helpful! I bought this book for preparing for the NCLEX-RN but I wish I'd had it when I started the nursing school. I am very thankful that my friend recommended this book to me. By all means, buy this book if you can. You'll be GLAD you did!! 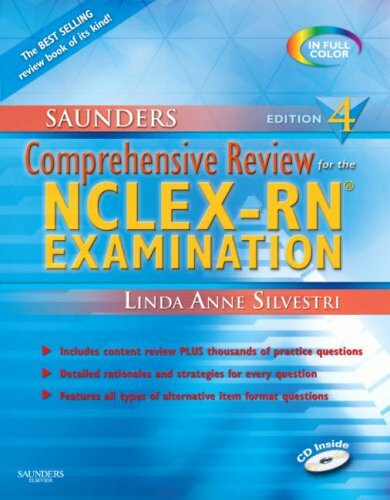 I would like to appreciate Ms. Linda Anne Silvestri (Author) for sharing her valuable knowledge with us and thank her for this valuable NCLEX-RN review book. Thank you again!